This year at Olympia was really one to remember... I have been very lucky this year to run Claire Burrell's super talented cocker spaniel, Teasel. Teasel is one of the most phenomenal agility dogs I know - her intensity, focus and intelligence really do amaze me. Teasel won Olympia as a 2 year old with Claire back in 2013, and this year she once again took the title of Olympia Small Winner, only this time with me running her :-P we won both the Jumping Speedstakes and the evening Final. It was a privilege to be able to run Teasel at Olympia - she really is awesome (running out of superlative to describe her :-)) We are next competing at Crufts in the British Open, Singles and Champ. Saturday was Large 6-7 day and Scandal's last time at Olympia. She is 8 now, and I feel Olympia is so physically demanding of our dogs, that I would never want to run her there and feel I am asking too much of her. I was pleased this year that Lee was judging (we have always done pretty well on his courses ;-)) and also that the rules have changed this year so everyone got at least 2 runs - the morning semi final and either the Jumping or evening Final. The morning semi final sort of went to plan - Scandal had the first pole (definitely not in the plan) so we had to go for time to try and get in the top 10. We managed this with an 8th place, and the fastest time overall, so this put us to run 3rd in the final. The final was a pretty testing course and seemed totally different to the course plan we had been studying all afternoon. You get literally about 2 minutes to walk the course (a different course to the one you thought you'd be getting ;-)) so changes to handling plans, and visualisation of this has to happen in doubly quick time. Scandal ran so so beautifully, I really couldn't have asked for any more of her. Unfortunately my legs had totally run out of puff by the time I got to the dogwalk, obstacle number 15 ish, I had pulled a muscle in my quad the day before, and by the Saturday evening it was soooo painful, dosed up on tablets but I think I needed metacam ;-) Scandal just couldn't hear me on the obstacle after the dogwalk, so did the world's widest turn (it felt like that at the time), and we came 2nd, by 0.08, to the incredible Pip (Scandal's cousin) and Lee Windeatt. So happy to have finally got into an Olympia final with Scandal, and she just loved the atmosphere. I'm 25 and work at Yeo Valley in Somerset. 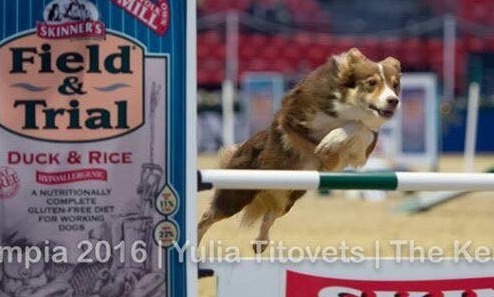 I have 3 border collies (Ricky, Tia and Scandal), and I compete in agility with Scandal.